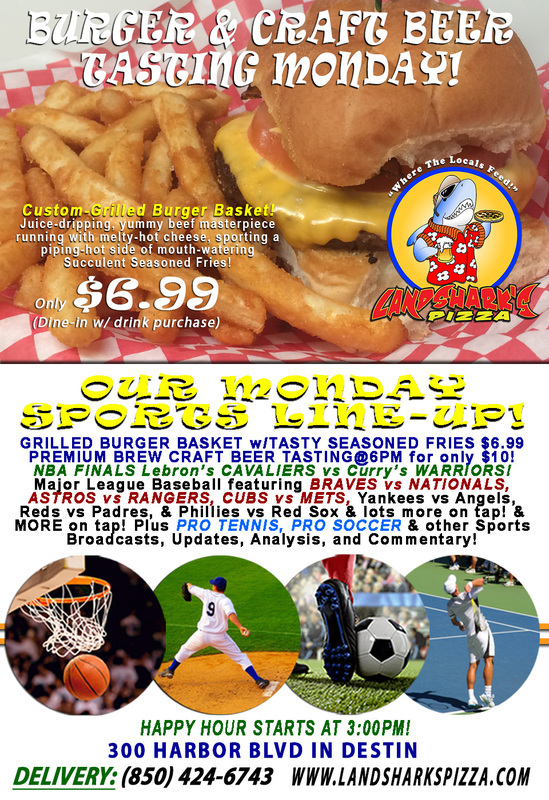 / Best Burger Deal in Destin FL / BURGER & CRAFT BEER Monday $6.99 Grilled Burger Special & NBA FINALS|CRAFT BEER TASTING@6PM! BURGER & CRAFT BEER Monday $6.99 Grilled Burger Special & NBA FINALS|CRAFT BEER TASTING@6PM! Everybody’s crazy excited cuz it’s MONDAY and that means a custom LANDSHARK’S BURGER & some premium CRAFT BEER to lift your spirits! Dive in to a custom-built hot, juicy, cheesy, melty feast of a burger accompanied by succulent seasoned fries (’til 5PM, $6.99 dine-in with drink purchase)! CRAFT BEER TASTING@6PM – Join in for ONLY $10 – Includes All-Access Wristband, 3 Tickets for sampling the Craft Beer Monday selections of your choice, 1 Full Pint of the Craft Beer of your choice! HOT SPORTS ON OUR ARMY OF BIG SCREENS – 2017 NBA FINALS featuring Steph Curry’s GOLDEN STATE WARRIORS trying to close out Lebron James’ CLEVELAND CAVALIERS! 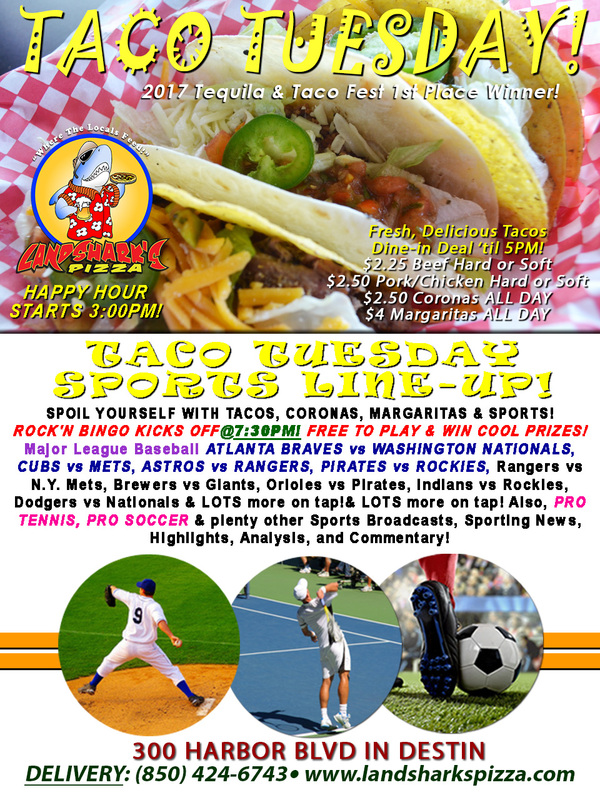 Major League Baseball bringin’ ya BRAVES vs NATIONALS, ASTROS vs RANGERS, CUBS vs METS, Yankees vs Angels, Reds vs Padres, & Phillies vs Red Sox plus more on tap! PRO TENNIS & PRO SOCCER coverage & plenty other Sports Broadcasts, Updates, Analysis, and Commentary! PGA Tour This Week: The Prestigious U.S. Open from Erin Hills Golf Club with $12 Million on the line! Pro Tennis this Week: ATP Mercedes Cup|ATP & WTA Topshelf Open. NASCAR This Week: Camping World Trucks@Gateway Motorsports Park on Saturday (June 17th)|Xfinity Series Racing@Michigan International Speedway also Saturday|Monster Energy Cup FIREKEEPERS CASINO 400@Michigan on Sunday (June 18th). 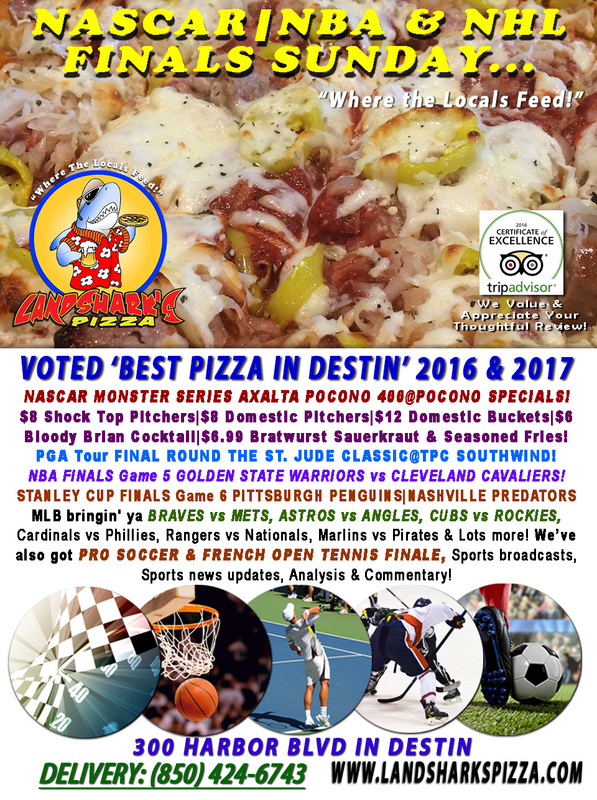 Previous Post: « Stanley Cup & NBA Finals, French Open Finale, AXALTA POCONO 400|$8 Pitchers & MORE NASCAR Specials!